The men and women filling the pews at Sacred Heart of Jesus Church in Baton Rouge bowed their heads in prayer, knelt during the Eucharistic prayer and held hands while praying the Our Father. It was a typical celebration of Mass except for the attire. These men and women wore uniforms, bulletproof vests and police duty belts that carried holstered firearms, ammunition, handcuffs, flashlights and radios. 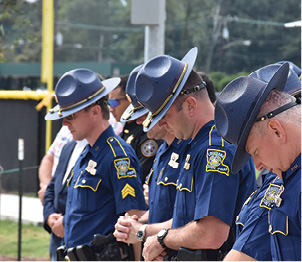 Officers and first responders from throughout the Diocese of Baton Rouge attended the annual Blue Mass at Sacred Heart on Oct. 10. Bishop Michael G. Duca, the first bishop of the diocese to celebrate the Blue Mass, spoke during his homily about the difficulty of maintaining an emotional distance during certain situations, something that he himself has dealt with as a pastor. “You can’t go in with strong emotions that affect you; you have to stand back so you can size up the situation,” Bishop Duca said. “But day after day, it can wear you down, where the distance can become so distant that you enter everything as a functionary. 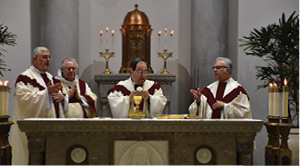 Bishop Michael G. Duca raises the host during the Eucharistic prayer while celebrating the annual Blue Mass at Sacred Heart of Jesus Church in Baton Rouge on Oct. 10. Sacred Heart pastor Father Miles Walsh is pictured right, and St. John the Baptist Church in Zachary pastor Father Jeff Bayhi and Deacon Clayton Hillier, deacon assistant at St. Thomas More Church in Baton Rouge, are pictured left. The bishop said that brings no joy into one’s life and, in fact, drains energy and causes fatigue. “Days like this (celebrating the Blue Mass) are to remember that what you do is important to us,” he added. “You bring hope into our lives. We depend on you. 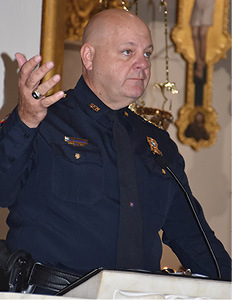 Bishop Duca urged the officers and first responders to protect their values. He talked about Jesus being the salt of the earth and how salt brings food to life, comparing that to emergency personnel doing their job. The bishop said their work brings hope to everyone. During a poignant moment, he told the officers the badge they wear over their heart is about protecting that engagement, that zeal, that appreciation that what they do is important. 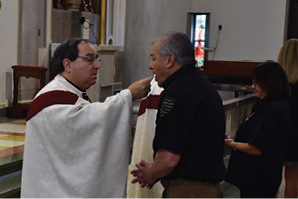 Bishop Duca gives Communion to East Baton Rouge Parish Sheriff Sid Gautreaux during the annual Blue Mass. “You’re on the front lines but we need you to be there with heart,” the bishop said. “This is important work; this is great work,” Bishop Duca said. “This is worthy of praise. It’s hard work. And, I really believe you have to have a calling for it. Part of having joy and fulfillment in your heart for what you do is to know you have support from those around you, citizens and government. Today, we want you to know you have our support, our prayers and we want you to know how much we appreciate what you do, that I appreciate what you do. 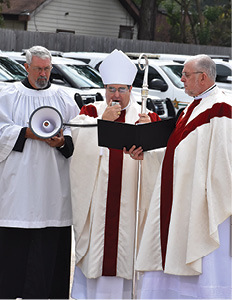 After the Mass, Bishop Duca; Father Miles Walsh, pastor of Sacred Heart; Father Jeff Bayhi, pastor of St. John the Baptist Church in Zachary; and Deacon Clayton Hollier of St. Thomas More Church in Baton Rouge, blessed the officers and their fleets of vehicles. 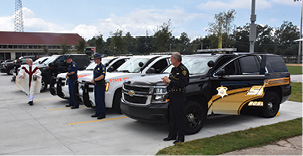 Law enforcement officers and first responders stand in front of their vehicles awaiting the blessing of Father Bayhi. Father Walsh also blessed officers and their vehicles. Many of the law enforcement officials in attendance showed their unity by joining hands during the praying of the Our Father. Bishop Duca prays for officers and first responders shortly before Father Bayhi and Father Walsh blessed their vehicles. 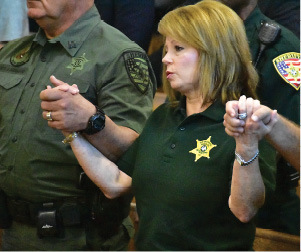 Louisiana State Fire Marshall H. “Butch” Browning offered the prayer intentions during the Mass.